Worldwide PC shipments are expected to fall by -6.0 percent in 2014, according to the latest market study by International Data Corporation (IDC). Mature regions did benefit primarily from a recovery surge in Western Europe while other mature regions performed modestly above expectations in the first quarter of 2014 (1Q14). Emerging regions continued to see weak demand and difficult conditions, although the economic environment in Latin America had the largest impact. The impact to emerging regions – a cornerstone of long-term market stability – outweighed the short-term boost seen in mature regions. As a result, longer-term growth was lowered slightly (by less than a percent for 2015-2017), with 2015 at -1.6 percent year on year with subsequent years still between 0 and -1 percent growth. "2014 represents an important shift for the PC market in emerging regions," said Jay Chou, senior research analyst at IDC. "Shipments in these parts of the world are expected to contract in double digits (nearly 20 million units fewer) compared to 2013." Positive factors for the PC market include slowing tablet demand and steadying economic indicators that are contributing to more stable PC shipments in mature markets. The Windows XP replacement activity that boosted shipments in the past several quarters is also expected to remain a positive factor for a few more quarters. This relative improvement in the outlook will enable the United States to further its lead in PC shipments over China and keep the mantle as the biggest PC market globally through 2017. Despite the pockets of opportunity, weakening growth in emerging regions and continuing pressure from other devices – primarily smartphones and tablets – continue to push down the long-term outlook. Consumer interest in PCs remains constrained and price-sensitive, as evidenced by overall market declines and still modest Ultrabook results, even as Chromebook vendors and channels expand and boost volume in this low-end segment. "PC shipments are currently benefitting from a lull in tablet demand due to rising tablet penetration in mature regions and competitive pressure on smaller tablets from large-size smartphones (sometimes referred to as Phablets)," said Loren Loverde, vice president at IDC. However, the transition toward mobile and cloud-based computing is unstoppable. 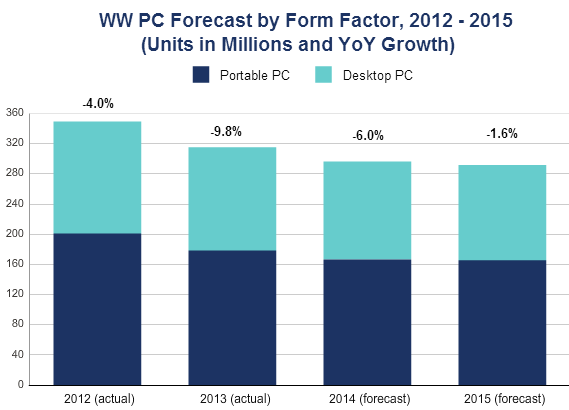 PCs continue a slow transition toward touch and slim designs, even as tablet volume is expected to pass total PC volume in the fourth quarter of 2014 and on an annual basis in 2016. To return to growth, IDC belives that the PC industry is going to need to accelerate the shift to lower-cost, thin, and touch-based designs, despite the challenges it has faced with these designs in the past.